“I missed my Scuba gear the most. Given we spent a large part of the trip close to the ocean it was hard to go past places and not be able to dive. Unfortunately with the amount of gear I take diving it would have meant leaving all of the kids behind! A kayak or canoe would have served us well especially in the croc free areas. We had racks for them but just shied away from buying them. Perhaps next time I will do a lap dedicated to fishing and diving. And so the long journey back south begins in earnest. The drive back from Usher didn’t seem too bad with only one termite infested tree blocking our way, then the corrugations to the Jardine River ferry didn’t shake the bones like they did on the way up. Maybe we have finally got used to bull dust and corrugations now? It seems normal to drive to the left of the road markings, along the less corrugated but clearly worn paths of the locals. On recommendations from travellers we had met on the Cape we were keen to explore a little of the Gulf side of the Cape. After 4 weeks on the Cape we were in need of supplies, particularly fresh fruit and vegetables, and curiosity was leading us to the city of Weipa anyway, so restocking and refueling was the order of the day. A quick stop was required, firstly at Fruit Bat Falls to wash away excess bulldust, then at Bramwell station to view the “Rego tree”. then on to Moreton station for the night. A “short cut” from the Old Telegraph Track south of Moreton took us across Batavia Downs station to York where we joined the Peninsula Developmental road leading to Weipa. With the exception of a few heavily corrugated sections this road soon improved and before we knew it we hit bitumen driving into Weipa. 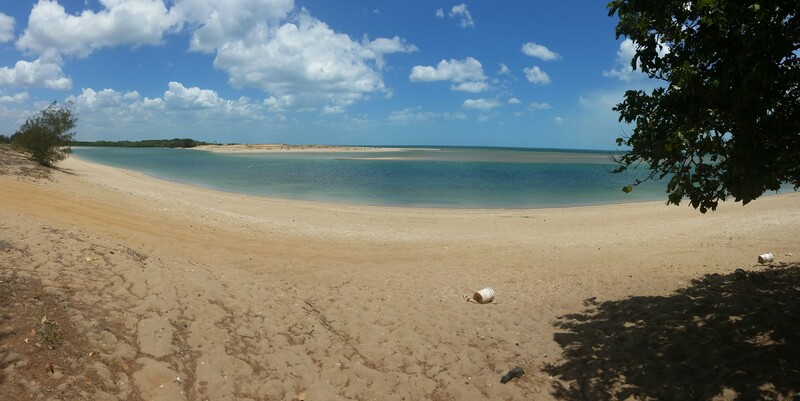 Just north of Weipa lies the Pennyfather River, supposedly a top fishing spot, but also a beautifully peaceful beach camp. Access is via a Rio Tinto mining lease and the only traffic lights we have seen for a while were those for mine vehicles passing. The boom-gate was broken so we watched quite a few monster trucks pass by, with loads of dusty bauxite piled high in the hold. Even the water trucks managed to dwarf our cars waiting patiently for the gates to rise. They follow behind spraying hundreds of litres of water on the road to reduce dust levels. In the end Simon jumped out of his car and physically lifted the boom-gate so all could pass. 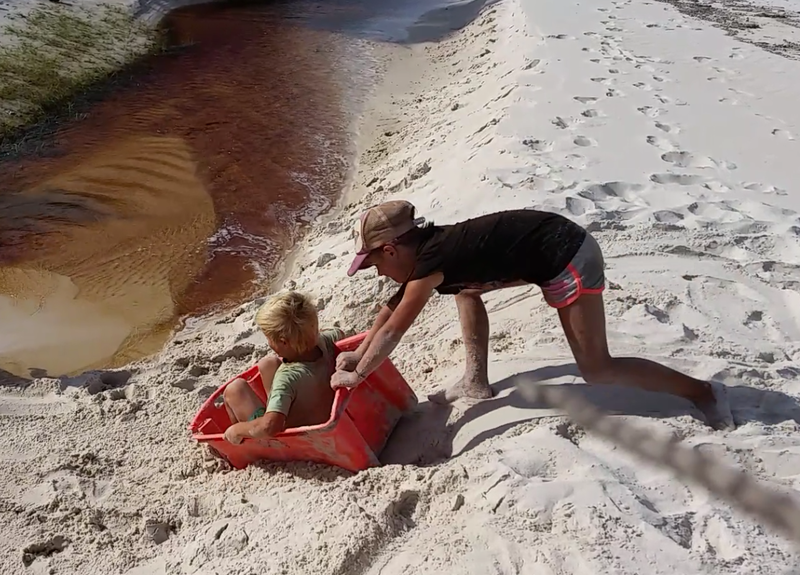 Being on Aboriginal land a permit is required but once there a very long beach offers many camping options, from basic amenities for a small fee, managed by a ranger to free camping along the beach, south of the local beach shacks. We chose the latter, searching for a site that another family had told us had the makings of a funpark made from washed up debris from the beach. After ten minutes driving along the soft sand it was time to stop and we found a great shaded spot with a tyre swing. The Gulf waters lapped gently on the beach and the glassy water was a welcome change from the wind blown east coast. Thirty minutes later an onshore wind blew up and brought a veritable swell with it, shattering the initial idyllic appeal of this west coast. It did improve the next day and we had fun trying unsuccessfully to catch massive trevally that were cruising up and down the shoreline. The fishing gods were not kind to us and once again sausages hit barbeque instead of fresh fish. 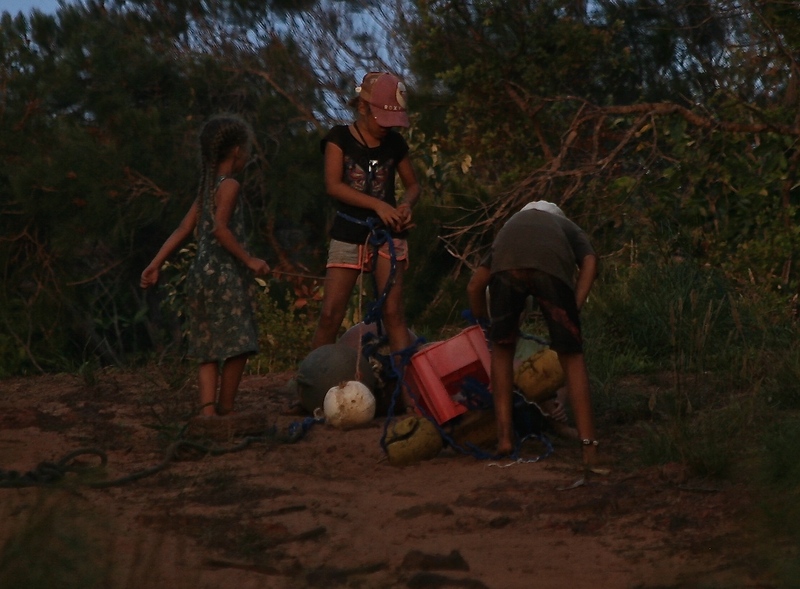 The kids built hammocks from fishing nets, strung between trees, and spent hours on the tyre swing. Whilst we didn’t find a plaque, and there must be one there somewhere, the Pennfather River has historical significance as being the first place that a European landed in Australia. Willian Janszoon, a Dutch navigator, sailing in the Duyfken landed here in 1606, long before James Cook. Today this area is totally alcohol-free and it is not permitted to even carry alcohol into this area, however, with no-one policing it, discarded bottles and cans litter the sand and bush where some people found it easier to discard rather than take the rubbish with them, thereby spoiling it for future visitors. The kids together with Simon and Hilary’s girls scoured the shoreline for materials and commenced building a “humpy” city. Humpys are the temporary shelters that aborigines used, conical huts made from logs, with leaves or fur to cover the roof. The kids made scaled down versions from the long mangrove seeds that can be found everywhere, washed up with each tide. Oscar and I slipped away for a quiet fish, driving down to Jackie Creek where we saw locals using spears to catch mud crabs amongst the reef. We had no success but witnessed plenty of “bait balls” of fish being doggedly pursued by larger fish around them and by a large flock of hungry terns diving wave after wave into the throng for a meal. The next day we returned at the right point of the tide and for a busy half hour caught mangrove jack for dinner, whilst keeping an eye out for a large crocodile we had seen when we arrived. The wild horses called brumbies proliferate around Mapoon and Pennyfather too and it isn’t unusual, driving along the beach, to spot small groups or see their footprints coming to and from the beach and swamplands behind. We only saw the one crocodile and had a couple of shallow swims, then a local advised that they live in the swamplands behind the beach at this time of year, waiting for the big wet to arrive when they become more mobile and visible. With the Tip thoroughly explored we decided to take a 50+km track with Simon, Hilary and the girls to Usher Point. The road condition and distance is sufficient to deter all but the hardened traveller, and from the Hema guide the track was going to be tough. We had heard reports of 5-6 hours travelling time required with bush tracks so tight you would be relieved of paintwork along the way. Parks and wildlife don’t encourage trailers either but we were up for a challenge, the first, and by far the hardest, booking one of the four campsites. Once again we wrestled with a ridiculous booking system, being told only one site was available by a second operator. The drive out was actually nothing like what we expected. It took two hours and the road must have been cleared in recent years judging by the size of the track and regrowth rates. No paint scratching on this track and very few challenges other than a couple of sections of soft sand. The Camprite trailer cruised through as it has done for the last 11 months without a hiccup. Our campground greeted us piled with flotsam and jetsam salvaged from the beach, a blessing in disguise as whilst unsightly it did provide hours of entertainment for the kids. The coastline was rugged and exposed to the strong onshore winds. The four campsites are spaced across 2+km of track, one in the rainforest, one in deep soft sand behind the beach, another perched precipitously on a totally unsheltered overhung cliff (not good for sleepwalkers), and ours, nestled in low-lying bush, very slightly sheltered. A lot of beach combing yielded more chambered nautilus shells, and a surprising source of multi-coloured clay that the kids insisted on bringing back to camp to play with. Much of the cliff was clay, however large islands protruded from the sand in places, with thin layers of many colours. 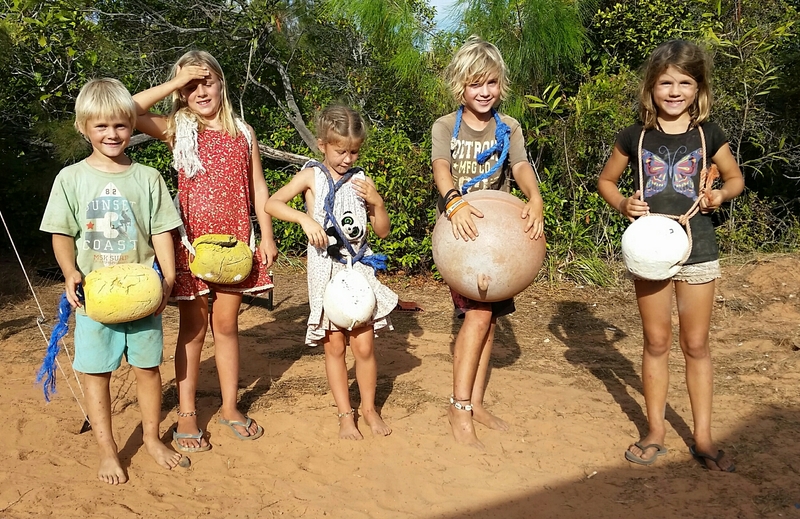 The kids used their imagination with items of rubbish found on the beach and from home-made go-karts made from fishing floats, raced down the track, to re-enactments of the Gunshot Creek crossing on the Old Telegraph Track, a lot of fun was had by all. 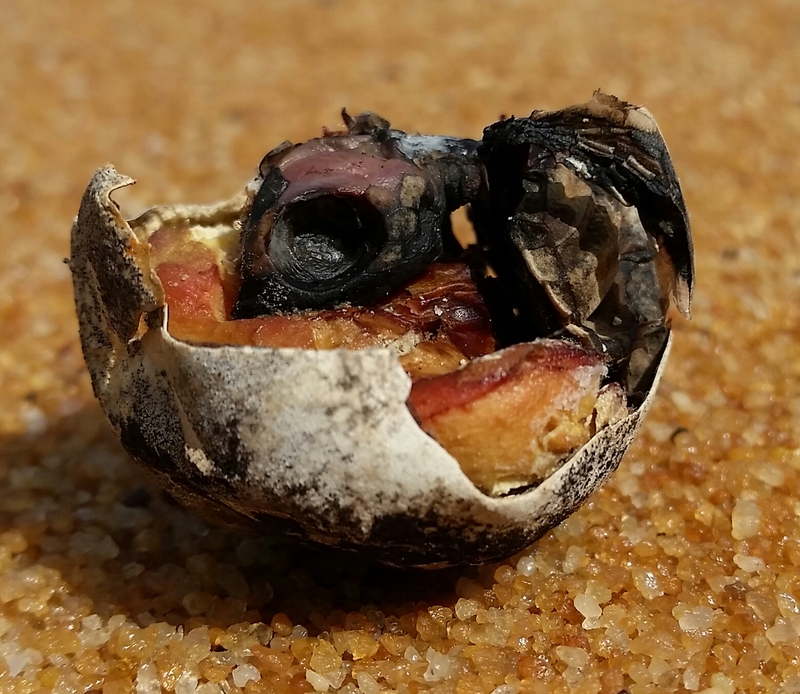 A broken turtle shell washed up one day with a dead embryo with features fully formed and clearly visible, including yolk. The drive from the camp to the beach was the biggest challenge requiring lowering tyre pressures to handle the soft sand track and campsite. This sandy camp was separated by a murky but shallow creek, but fresh tracks indicated that it was inhabited by a small crocodile. We stayed for three days, exploring the beaches, driving to Sadd Point nearby, and pushing an extremely scratchy track towards Escape Creek, where at times we were pushing over saplings higher than the car that were growing in there middle of the track. I found a new favourite bird, the aptly named Magnificent Riflebird. 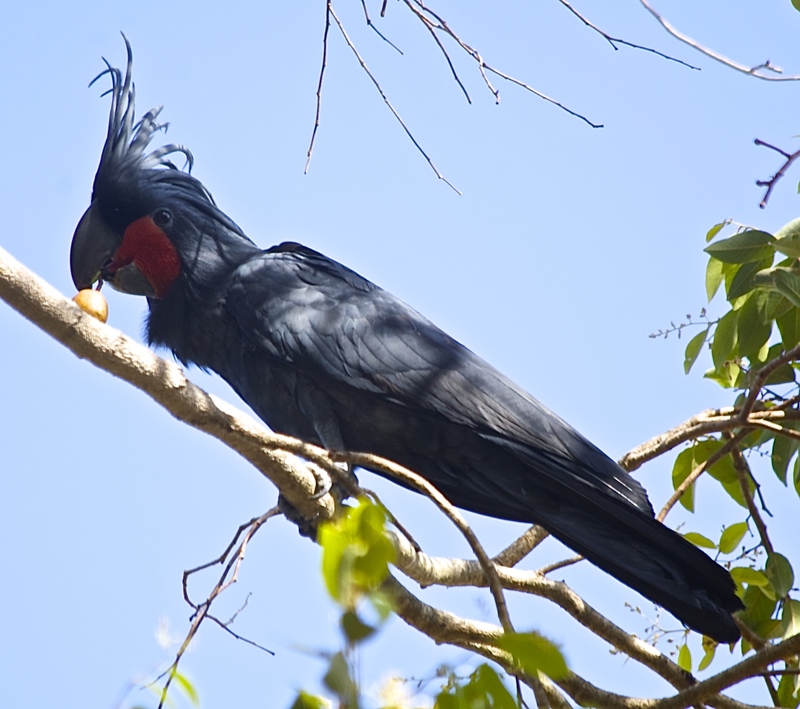 Having heard its call I managed to coax one in close to see its beautiful metallic green collar, and hear its rustling feathers as it chased a female through the treetops. It eluded my attempts to photograph though. 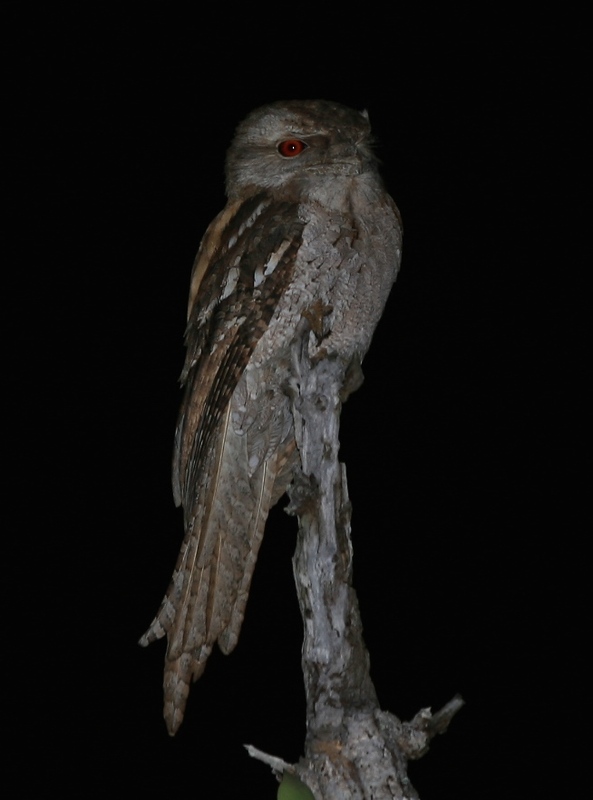 Around the campfire on the first night we were interrupted by the erratic flight of a nightjar fluttering past several times. Following the frog-like sounds I found two sitting on the track every night. A Woompoo fruit dove allowed a close photo too one evening and once Simon’s very successful coconut lemon cake, cooked in the camp oven, wafted into the air we got regular visits from the local bandicoot. Despite insistences from the booking consultant that campsites were full we saw no-one for three days at Usher Point. As we drove out a fallen tree across the road might have explained why, but four adults could move it aside quite easily, before we needed to reach for winches or saws. With the northern most compass point of the mainland behind us there was still plenty to do. We explored a 4WD track from the tip that crossed to Punsand Bay. A fairly tight and rugged track but not too difficult. 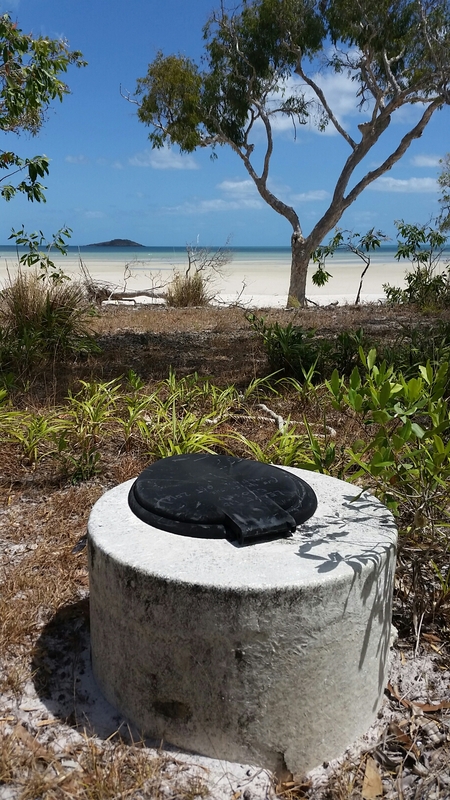 The old telegraph terminated at a concrete bunker located just behind Cable Beach. Further on little side tracks around Roonba point took us to isolated beaches and mangrove forests, where corkscrew palms spiralled their way towards the sky. Amanda stopped to investigate orchids growing amongst the tree branches, a few flowers starting to show. One track led along a beach offering camp opportunities all over the place. We even stumbled, almost literally over what was arguably the best “Loo with a view”, a concrete construction, seat but no surrounding privacy. Just sit down and enjoy the view. There are also a few historical remnants from WW2 in the area and to explore these we moved to Alau Beach as a new base to explore. Firstly we visited two plane wrecks, a DC3 bomber and a Bristol Beaufort, both having sufficient remnants to make them out. There are references to 3 other wrecks but without further information we couldn’t seek them. We drove down to Jacky Jacky creek on a increasing derelict track to a local camp that must be used for collecting mud crabs and mud clams amongst the mangroves. Another road took us out to Muttee Head, and beyond to the mouth of the Jardine River. 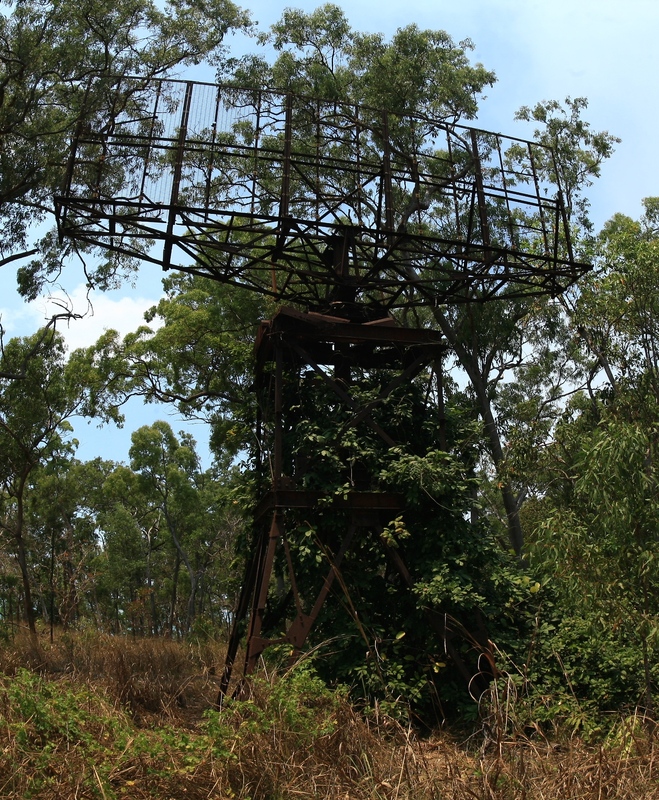 An old derelict and severely rusting radar tower stands forlornly in the forest, covered in vines, a stark reminder of the proximity of this part of Australia to action in the war. Around the sleepy towns of Seisia and Bamaga it was impossible to miss the large numbers of horses wandering around untethered. Roaming along the roadsides, grazing through peoples gardens, some of them looking in very fine condition. Every now and then youngsters would trot past on their unsaddled steeds, all very adept in the art of horsemanship no matter what age. We moved to Alau beach for a few days and Oscar and I took time out to fish from Seisia Jetty, once the weekly barge had been unloaded, reloaded, and departed. A large group of locals played in the water next to the jetty and a group of youngsters brought their horses for a swim to cool off in the searing heat of the midday sun. The teenagers led their horses into the water, then stood on their backs and performed backflips into the water, in an effort to entertain the younger boys watching. Once cooled off they mounted the horses and cantered up the beach and back to the crowd swimming and frolicking behind us. I felt a large tug on my line then suddenly the water surface erupted with a pirouetting shark, over 2m long. It performed this action 3 times, its entire body clearing the water each time, as it stripped line off my reel, then thankfully snapped it. A laconic comment from an elderly local fishing nearby suggested this was why no-one was catching anything. Another fishermen barked a call in local tongue to the crowd in the water and a mass exit, that any lifesaver would have been proud of, took place in seconds. Apparently crocodiles are not scary but big sharks are! Back at our beach camp in Alau, the local trees acted as magnets for the birds and we were treated to Palm Cockatoos, yellow bellied sunbirds, frogmouths, kingfishers and many more. Firstly thanks to all the responses helping with my computer. It probably won’t be fixed until we get home which means blogging will be less frequent and probably fewer photos for a while. After decamping from the beautifully tranquil Jardine River a short but very corrugated drive brought us to the ferry crossing where the 20m crossing costs you $129 and lasts barely a couple of minutes. 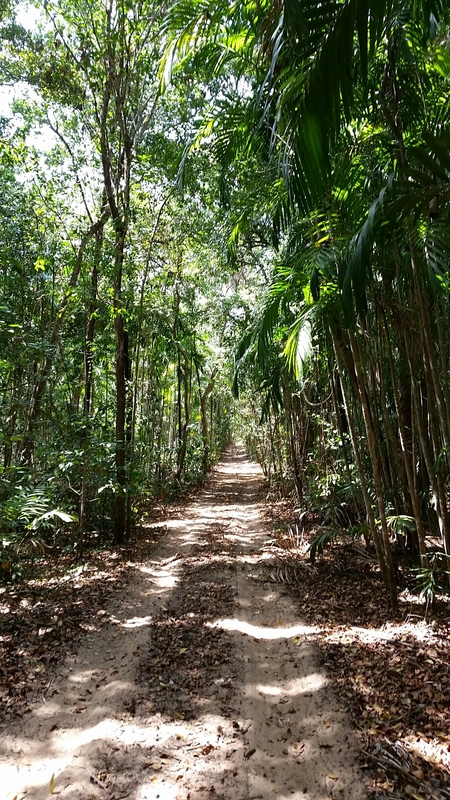 It sounds expensive but is a return fare and does include the permit to enter the indigenous area as well as camping in designated areas around the tip of Cape York. Bamaga is a sleepy township in the far north, offering a decent sized supermarket, post office, tavern, bakery and general store amongst others. A hasty re-fuel and restock and we headed 35km to the north easterly point of the Cape, to a campsite called Somerset. The Somerset Homestead is now in ruins, established in 1863 by John Jardine, farmed cattle, copra and had other commercial interests that included involvement in the pearling industry. Near to the campsite there are some old cannons, gravesites and some derelict ruins providing the inquisitive with a glimpse into the hardships of the past here. Fragments of old hand-blown black glass bottles can be found scattered in the bush, many dating back to the late 19th century. Along the shoreline, behind the mangroves you can also find the remains of an old freshwater spring that was pooled as salvation for shipwrecked sailors, and graves of Japanese pearl divers. Also along the shoreline, after negotiating crocodile infested mangroves and climbing the sharp rocks some remarkable indigenous art can be found in a cave, considerably pre-dating the homestead. Figures of fish, crocodiles and turtles, as well as other unidentifiable shapes were all clearly visible. Some 900m away the large island of Albany offers fishing charter holidays, but has untouched beaches covered in turtle tracks with crystal clear water. The island also offered some protection from the prevailing onshore winds that greeted us all the way up the east coast of the Cape. We explored the neighbouring coastline taking the five beaches track that weaves southwards through the bushland between beaches. We met another family with kids at SDEPS (whom we hadn’t seen for months) and took the photo at Fly Point of all the 8 kids. At the end of the track we found tracks that kept going and we explored at least two more beaches, the kids finding plenty of their new favourite shell, the chambered nautilus. Surprisingly there was less rubbish on the beaches here, probably because of the protection from Albany island. The abundant and unique birdlife at the tip of the Cape York also provided an interesting diversion at dawn whilst everyone else was still waking up. The tally is now fast approaching 300 species on the trip and favourite birds have been changing regularly. 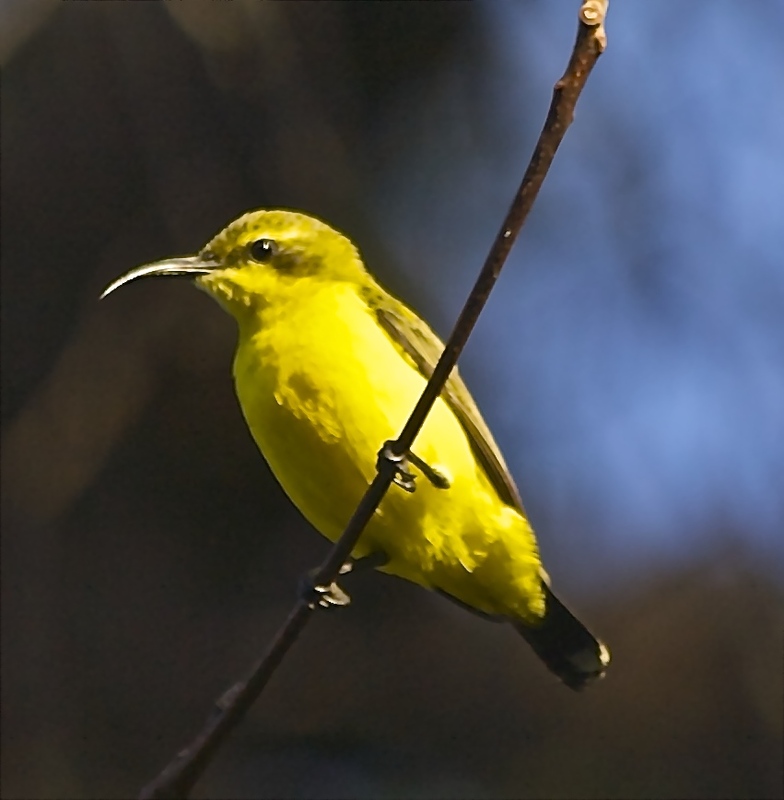 Here the yellow-bellied sunbird was a welcome treat around the trailer. The next day we had a challenge to meet, the third compass extremity of the mainland, Australia’s most northerly point. The dirt road wasn’t too bad, weaving at times through lush rainforest, before opening up at the beach. A short walk over the craggy headland past enormous rock cairns brought us to a very unimpressive simple sign at the northerly tip. Three down one to go! With the Lenovo seeming dead I have adopted an Apple to continue blogging! The Old Telegraph Track(OTT) is a very popular 4WD track that heads north up Cape York from Bramwell Station to the Jardine river and beyond with the Telegraph terminating at Cable Beach near Punsand Bay, only 20km or so from the most northerly point of mainland Australia. We left Morton Telegraph Station early, quickly drove 42km to Bramwell Station, keen but unsure what to expect at the first challenge Palm Creek. A small wooden sign, not worthy of a photo pointed the track past the station and we pulled up at Palm Creek behind a big tour bus and a couple of other cars. Their eyes lit up and everyone reached for their cameras when we said we were going to cross. It was certainly a bit more challenging than I was expecting but the word was if you can do this crossing you can complete the track. The entry into the creek was a two step, narrow muddy track with the tiniest bend towards the base. Total drop was possibly ten metres. With other people arriving behind I jumped to it, handed cameras and video to people and started the GoPro running. In the excitement of the moment I then made a number of rooky errors. Firstly, the GoPro was in camera mode so I got a photo of me looking at the camera – oops. Secondly, feeling the pressure of people waiting to cross I forgot to reduce my tyre pressures. The descent was relatively easy as you just have to get your tyres in the tracks and keep them there while descending in low gear. The opposite side offered two exits and we chose the direct one. Naively thinking we could savour the moment with a slow ascent, I underestimated the traction on the slippery incline and sheepishly descended backwards after getting only the car nose to the top. On the next attempt I made my third error trying to ascend before the low range gear had engaged properly. The third time I beckoned to Amanda to grab the winch, put it round the nearest tree and 5 minutes later we were out. The tourist bus was happy with the spectacle but it was a very amateur effort indeed as the next cars showed us, roaring past in one attempt. The ice was broken and we were on our way at last. Three kilometres later we arrived at Dulcie Creek, where track notes indicated care required to avoid deep holes. A muddy puddle sat in the middle of an otherwise dry river bed so this obstacle was passed with relative ease. Dulhunty and Bertie rivers provided more water but these were more a case of avoiding deep holes in the rocky bed, nothing a quick wade in the crystal waters couldn’t solve. The infamous challenge on the OTT is Gunshot Creek and we chose not to do this challenge as we were towing a fully laden Camprite trailer that we still needed to live in for some time. We bypassed this and setup camp at Cockatoo Creek, another crossing where deep holes in the riverbed need to be treated with respect. We camped above a deep waterhole and the kids spent the afternoon fishing and swimming. I spotted a big barramundi whilst spotlighting that night, and a quick well placed cast landed a 70cm fish for the next evening’s dinner. Up early in the morning I took Oscar for a fish, still seeking his first barramundi, and landed a 72cm Sarotoga on my second cast. Unfortunately Oscar only caught some good-sized grunter. We also got a visit from the rare Palm Cockatoo which is a magnificent bird with a huge beak, black with red cheeks and a huge array of long feathers on his head. So far the Camprite trailer was holding up very well and all was good. As the sun rose we prepared for as visit to Gunshot Creek.